Of course, every year I have to run through weeks of "What do you want for your birthday?" with the kids. But I'm not asking about what present they want. I'm asking what CAKE they want. This year, my daughter, soon to be 5 years old started out with Jack Skellington. Then it changed to Batman (with a boomerang). Then it changed to Hello Kitty. Then Happy Feet (I was actually looking forward to making penguin cupcakes) and then, finally, she settled on Blue's Clues. If you've read many of these posts, you know I like working with Candy Melts. I use them in all colors and for all things. Well, for this year's Blue's Clues birthday party, I lucked out. 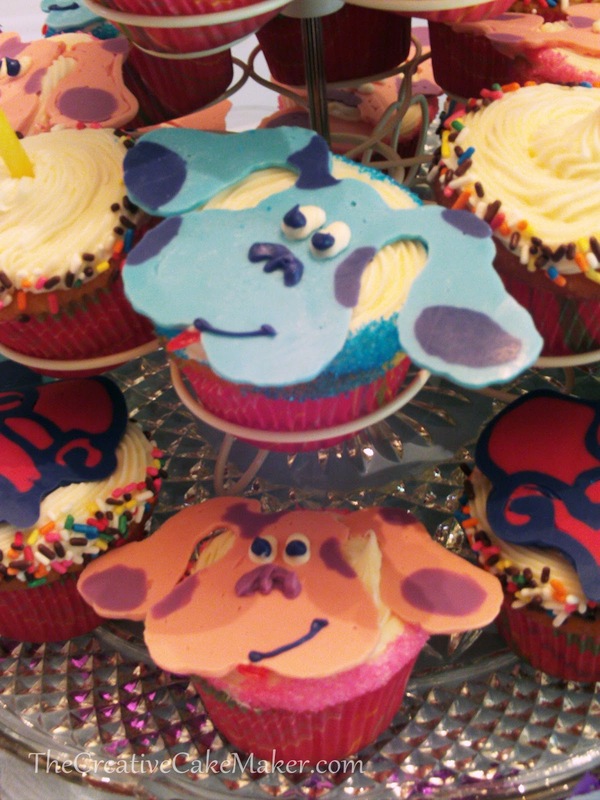 Nick, Jr had a recipe for Blue's Clues Cupcakes that were just my speed. Plain cupcakes with their edges rolled in sprinkles and topped with "Blue" made from melted light blue (and dark blue) Candy Melts. They couldn't have been cuter! You can find the instructions and a template on Nick,Jr. I couldn't stop there, though. I switched up the colors and made Magenta out of pink and purple Candy Melts. Then I made a template on wax paper for the Thinking Chair - which surprisingly, turned out to be a very popular cupcake. I used red and dark blue for those. We also found some paw print chocolate lollipop molds at the craft store and made some to go in the party favor boxes. Those were really a hit! 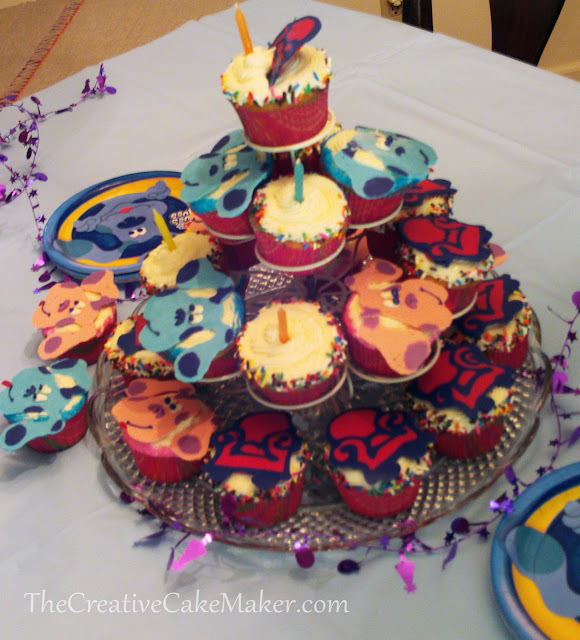 Once we learned Blue's Birthday Candle Dance and had paw print stickers eveywhere (she stuck them EVERYWHERE), we were ready for a party! TIP #1: These are very time consuming so you may want to spread it out over a 3 or 4 days/afternoons/evenings. The cupcakes are a snap to put together so save the baking and icing for last. When making the Candy Melt Blue and Magenta, start with the spots and the head. Then do the eyes, nose and mouth. This gives everything plenty of time to harden. TIP #2: I made Blue by first making her dark blue spots then filling in the template with the light blue. This way, once the chocolate candy dried, I could peel it off the wax paper and flip it over revealing a smooth face with spots. The reverse side was so lumpy, it looked awful. TIP #3: Be VERY careful when removing the hardened chocolate from the waxed paper. The spot where Blue's ears meet her head are very thin and break VERY easily. I had to doctor quite a few ears before I placed them on the cupcakes. 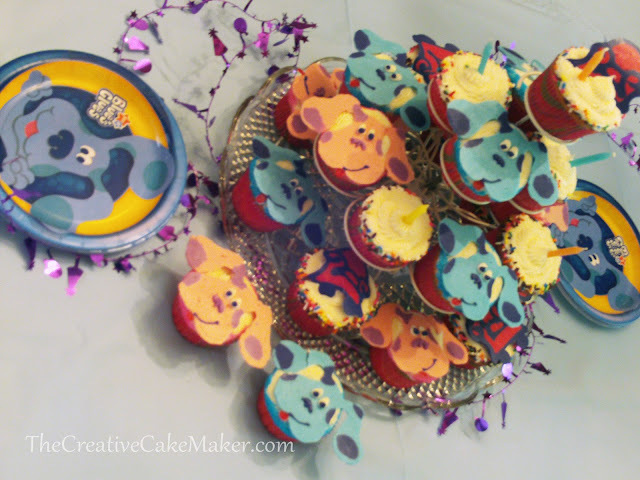 TIP #4: To get the sprinkles only on the edges of the cupcake, pour some sprinkles into a generous pile on a plate. Take a FRESHLY iced cupcake and roll the edge through the sprinkles. Fresh icing is still "sticky" allowing sprinkles to stick to it. I've never used the melting wafers.....do they sell them at the grocery store or do you have to get them somewhere special? You can use Wilton Candy Melts or another brand of candy melts. I have seen both available at craft stores (Michaels and AC Moore) and at Walmart. The non-Wilton brand is MUCH cheaper and works just as well (the bag is also bigger).